Not every street in DC has a sidewalk. In fact, there are large swaths of the city where they’re a bit more rare than we’d like. DC City Council has been looking at a common sense law to add them in where they’re missing for the last two years, but haven’t come to any kind of conclusion over whether or not they’ll be in place anytime soon. 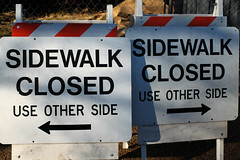 At question are property-owners’ rights, many of whom without sidewalks are requesting that their right not to have them be granted. There’s $9M in stimulus funding for sidewalk creation and improvement in the District’s budget this year, and it’d be nice to see used before we lose it, Council.